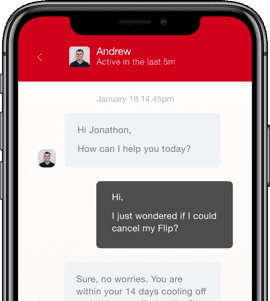 Flipper is so much more than just a switching service. Our personalised, intelligent approach to saving money on energy has a proven track record of saving buckets for our customers. Find out how we do it here. Flipper membership costs £30, but you’re guaranteed to find some serious savings in return. Our intelligent algorithm, called Joules, searches the market to find you the guaranteed best deal. Here’s just a sample of what you get when you join Flipper. From the get-go, Flipper uses the information unique to you to help you save smarter. This personalised service is unique to Flipper. Instead of usage estimates, we use the actual data from your bills to calculate a highly accurate estimated saving. We get your bills from your online energy account. 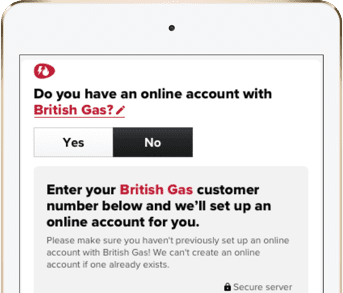 If you don’t have an online account, we can make one for you, or alternatively you can upload a PDF bill if you’d prefer not to give us your customer details. We’re so sure that we can save you a bundle, that we won’t charge our fee until we’ve guaranteed you a saving of at least £50, even after taking exit fees into account. Although £50 is the minimum you could save, most Flipper customers save a whole lot more than that. 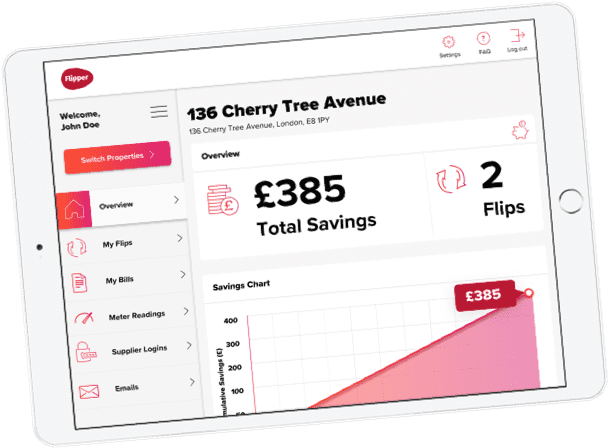 In fact, from 2017 - 2018, our customers saved an average of £385 per year using the Flipper service. What’s not to love? We want to make sure you’re getting the best possible deal, and that means scouring the market. We don’t give up easily. If our intelligent algorithm can’t immediately find you a better deal in the market, we’ll keep checking every two weeks until it does, 100% free of charge. As we flip you to better tariffs throughout the year, we consider more than just savings when determining your best deal. Joules is our intelligent algorithm and it examines exit fees and switching times to maximise your potential savings and deliver the greatest value for money. 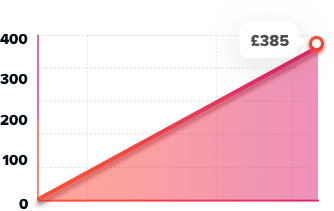 When Joules finds you a new deal, it will calculate whether you’re better off flipping suppliers immediately and paying an exit fee, or waiting a little longer to avoid it. Savings are calculated with exit fees included, so the saving figure you see is how much you’ll save after fees are deducted. If we've already switched you to a tariff that has exit fees, and we switch you again further down the line, it’s because you're saving more money even after the exit fees have been paid. 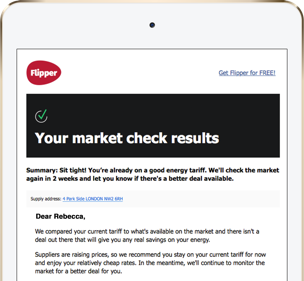 Flipper doesn’t take commission like price comparison websites, so we’re not in the energy companies’ back pocket. That means we can provide you with a totally impartial overview of the market, and pass any savings directly onto you, the customer. Price comparison websites make money by charging energy suppliers commission for every referral they make. 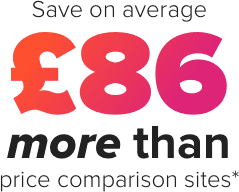 As a result, the prices you see on price comparison websites are over-inflated, and often not an accurate representation of the best deals available. At Flipper, we charge you a membership fee because we don’t take commission, meaning every deal we find is really, truly the best deal available on the market. *Based on an energy usage of the typical household on a standard tariff. 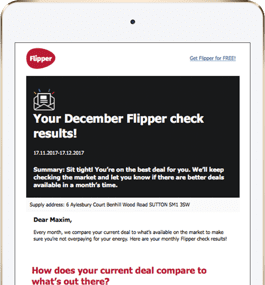 Changing energy suppliers with Flipper is so easy you could do it with your feet. Simply fill in a few details here, and you’ll be on your way to stress-free savings. That’s instant cheaper energy bills and cash in your pocket! All we need to get you started on your saving journey is a few basic details from your bill, and your location. We can instantly provide you an accurate savings estimate. 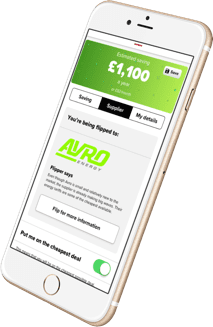 If you think we’re the right fit, it takes no more than five minutes to get set up with your Flipper account and start saving. We communicate directly with your old and new suppliers and manage your ‘flip’ from start to finish, so you won’t have to lift a finger. Our team will handle all of your switchover paperwork and make sure everything runs like clockwork, with no interruptions to your gas and electricity supply. Research shows that most people don’t find the best energy deal when they’re searching for it on their own. In fact, our study shows that 96% of people can’t find the cheapest deal on a price comparison website. On average, our respondents missed out on £71 in savings. 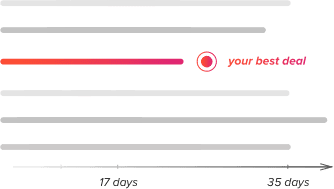 Our intelligent algorithm, Joules, does all of the searching and calculating for our customers, and flips automatically at the optimum time, meaning that there’s no chance of you missing out on a great deal. Don’t like the deal you’ve been flipped onto? Had a bad experience with one of our approved suppliers in the past? Don’t worry, you can ask us to exclude certain suppliers from our market search. If you’re not happy, you’re more than welcome to cancel your flip, no questions asked. We don’t just find you a great deal and leave it at that. As a Flipper member, you’ll see and be flipped onto the best deals on the market almost as soon as they become available. 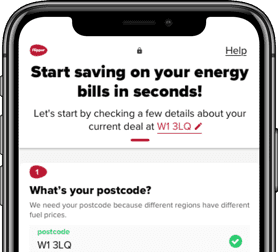 Every month, we’ll re-check the entire energy market, and if we can find you a better deal, that saves you at least £50, we’ll flip you again — simple, straightforward and hassle-free. We’ll flip you as many times as is required to keep you saving money. Every month we’ll check the market using our intelligent algorithm, called Joules, and if there’s a better deal out there for you, we’ll flip you again for free. The best way to save money on your energy bills is to switch suppliers regularly, making sure that you stay on the best tariff. This can be difficult and time-consuming, which is why Flipper is so great. For as long as you’re a Flipper member, we’ll take care of everything for you: from keeping track of when your deal expires to managing your flip from start to finish. We’ll even take care of the paperwork and speak to your supplier on your behalf every single time you flip. You really won’t have to lift a finger. If you’re not happy with a flip, you have 14 days to cancel it, no questions asked. You can tailor the results of our market search as well, by personalising your preferences in your Flipper account. We’re always here for you when you need us, and we take care of the entirety of your energy supplier flip, from beginning to end. We know that changing energy suppliers can be a daunting task. We want to make it as smooth and hassle-free an experience as possible. If there’s any issue with your switch process, we’ll call your supplier and resolve it on your behalf. If we need you to act in any way, we’ll alert you. 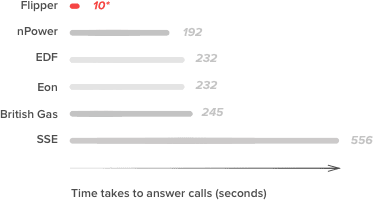 *97.32% of all calls were answered within 10 seconds (27/12/17 and 26/01/18).